I was going to finish and publish this later as I am planning a pool trip with my four year old. Computer off, suntan lotion on, out the door and locked. Wouldn't you know it started to rain? That's the second time today I was outside and it rained. I did the last 15 minutes of cutting the grass this morning in a sunny downpour. Typical Florida. No sooner did I finish the lawn than my wife told me the washing machine stopped mid-cycle for no reason and wasn't working. Great. I turned a few knobs, flicked a few circuits, opened and closed a few doors, checked a few pipes... Then I gave up. What could I do? When my wife said "that's not good!" I didn't really give a very nice answer--it was like a "nice" Duh! I told her to let me think about it. So a few minutes later I went back into the laundry room, did another battery of clueless-guy tests and voilà, problem solved. I still don't really know what I did, though I have a slight idea, but I told my wife it's because I am a mechanical genius. And she wouldn't even play along. Go figure! This afternoon I'm drinking XXXX IPA brewed by Shipyard Brewing Company in Portland, Maine as part of Pugsley's Signature Series. 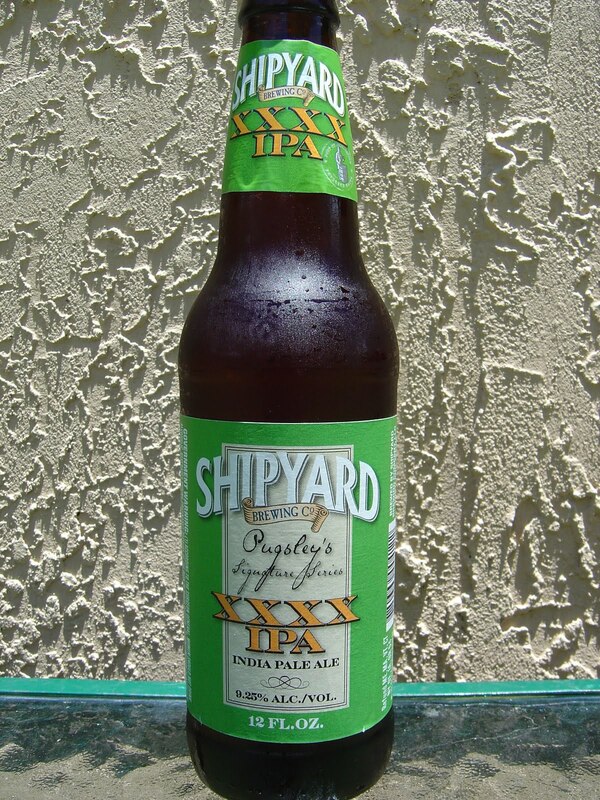 I have seen this beer around in the past but in big bottles only, and considering I am not a very big fan of Shipyard to date, I had always walked on by. So last week when I saw this beer in a 12 ounce version, I decided it was time. The label is nice: design, colors, lettering; the upper label was very crooked though. Best Enjoyed Before May, 2011. Hoppy pine aroma, but a sweeter caramel also alternates with that, back and forth. Bitter pine and citrus flavors start things out, not overly bitter but a good bite up front. You will then notice a sweet layer of candy and tropical fruits right on top of those. Pineapple, mango and tangerine, very juicy and sweet. The bitter and sweet are not blended; rather, they are just matched up in a way that accentuates the other. (Think "you got your peanut butter in my chocolate" commercials.) Some spicy black pepper shows its way in toward the end, along with a noticeable 9.25% alcohol warmth. Good carbonation. By the end, you will realize that sweet is the victor in this beer, as the body will be on the chewy, heavy side. Great flavors, slightly too sweet, but I would for sure recommend this beer and will drink it again myself (No, Ed Roberts, not another rerun here any time soon! Just for enjoyment.) I'm pretty sure this is my favorite Shipyard beer by a mile! This one and the picture above are pretty nice pictures, right? Practically professional! Never even seen it before! I need to branch out from my friendly neighborhood liquor store and try some places across town I've heard have a wider selection. If there's one area most places are lacking in, its IPAs. They'll have every wheat, stout and Belgian known to man and then like, five IPAs. Blah. A solid IPA selection is a must! Kelly (@thecervezachica) has been raving about this one for a while and I, too, waited to pick it up once it was available in 12oz. Haven't tried it yet but I'm eager to. Hey Joel. Yeah, I heard her mention it that night in Boynton Total Wine. Let me know when you try it. This was the first beer I ever had on tap at Bx BeerDepot. I still love it! Totally agree with the sweet over the bitter on this one. I thought it was a great balance and the thick body gave it some weight which was nice. Have you tried Hop Henge from Deschutes? It's a seasonal special but it was a great sweeter IPA. One of my favorites. I had it from a bottle, as you saw, but I'm thinking I might need to find a tap based on your and Kelly's recommendations. I really liked this beer and though sweet won, it had a nice balance. We don't get Deschutes beers here in Florida, and I've never managed to score a Hop Henge by alternative routes. A friend did bring back a couple Deschutes beers from an AZ business trip, but this wasn't one of them. But it's now on his next list! Thanks.